This chapter views online reverse auctions from the purchasing agent’s perspective. I found that purchasing agents with a high level of buying experience will perceive that online reverse auctions have a negative impact on the trust and cooperation in supplier relationships. Purchasing agents did not see a negative impact of online reverse auctions on long term viability of suppliers. The chapter discusses the evolution of the buyer-supplier relationship, emphasizing the critical success factors in supplier selection. Further, it discusses the role of the online reverse auction in the buyer-supplier relationship. 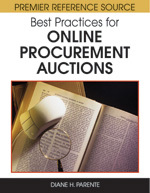 By understanding the lens through which purchasing agents view online reverse auctions, managers can do a better job of managing the procurement function through improved training programs for purchasing agents that incorporate the appropriateness of online reverse auctions vs. other sourcing strategies. In addition, they will be able to better manage online reverse auctions, minimizing any negative impact of the auction on existing supplier relationships.